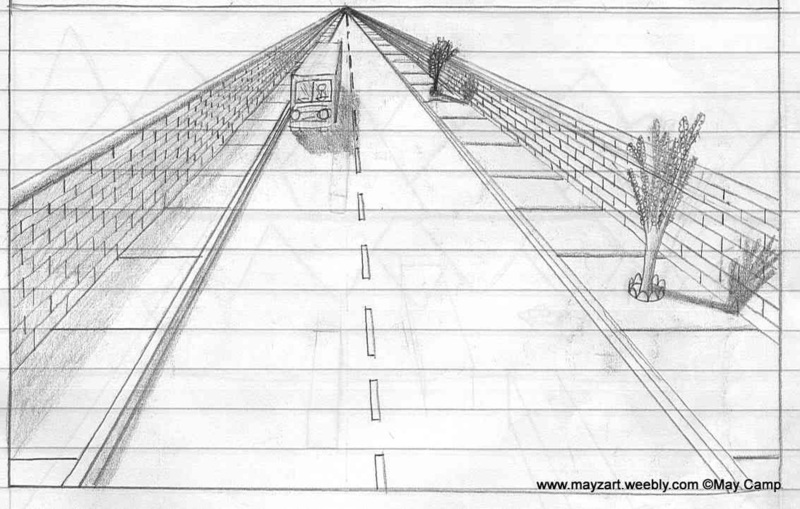 Description: Perspective drawing of the street that has a bus traveling toward you. Sidewalk with trees on one side and brick walls on both sides. Shadows to make it look more three dimensional. Lines define the edges. Artist Comments: My dad once taught me about perspective, and I used what I knew and my shading techniques to make it look nicer. This was mostly a practicing sketch, but I like how it turned out. I didn’t use my realistic technique (of shading without lines defining the edges) in here because I didn’t learn it yet (these art pieces are somewhat out of order because this was such a long time ago). I drew everything with lines first, paying careful attention to the smallest details like the bricks in each well. With this picture, I learned a lot about how things get smaller and the line spacing on the wall get closer and closer together. I drew the road lines in the middle first, and didn’t actually notice until much later that the lines should have become shorter and closer together faster, but I learned the idea with the bricks. All I remember knowing before doing this was the point and how all the lines (except for vertical and horizontal stuff) go to that point, and the tops of the same sized trees would touch a line that goes to that point, that’s how I sized the trees.